I am trying to find healthy go to snacks to help me through my day so that I don't turn to junk food as much. In that vein, I recently found a recipe for Chocolate Truffles here on the Melbourne Natural Medicine Clinic website. I already had all of the ingredients to make these chocolate truffles, so I decided to give them a go. These vegan, gluten free truffles are very quick and easy to make, and require little attention - I made them while watching TV. The dough came out surprisingly thick, so rolling it into balls was not a problem. I rather enjoyed these truffles. They are not very sweet, but they have a pleasing soft texture with a bit of crunch, and they help to satisfy hunger cravings. I'd make them again. For French Fridays with Dorie this week, we were assigned one of our last dessert recipes - nutty, meringue based cookies called croquants. I had wanted to make these for ages, so I was really pleased with this week's pick. The recipe sounded just like cookies that are served alongside coffee in one of my favourite chocolate shops, Ganache Chocolate. Croquants are super easy to put together - they are just chop, stir, dollop and bake cookies. For the nut component of the cookies, I used chopped roasted almonds. These crispy cookies are perfect on their own, although as Dorie suggests, they would also make lovely icecream sandwiches. To see what the other Doristas thought of the croquants, visit the LYL section of the FFWD website. It is week 2 of our new group, Eating with Ellie, where we cook along from Weeknight Wonders by Ellie Krieger. Kayte had kindly sent me the recipe, but today, my book arrived, so I am in action. This week, Margaret chose Shotgun Wedding Soup. I had no idea what this was until I read the recipe, but apparently the name has to do with the marriage of meat and vegetables. It is a kind of chicken soup with egg and spinach that reminded me of chicken noodle soup from a Chinese restaurant, sans noodles. I made a half recipe (no idea what I'd do with 8 cups of soup! ), which was plenty for two meals for me. I minced a chicken thigh myself instead of buying pre-minced chicken, which can be a bit dry. This soup made a quick, tasty meal. I liked it rather than loved it, but I learned a new dish. To see what our other EwE cooks thought, visit the LYL section of the EwE website. Our Wednesday with Donna Hay pick this week is from Chaya, who selected Spinach, Fetta and Pinenut Risotto, available online here. I had no pinenuts, so I used chopped roasted almonds in their place. To see what everyone else thought of this dish, visit the LYL section of the Wednesdays with Donna Hay website. For Tuesdays with Dorie this week, our assignment was brown butter and vanilla bean weekend cake. I was excited to be making this cake because it received rave reviews on the discussion forum from those who had already made it. Dorie informs us that this cake is called a "weekend cake" because it can be made on Friday and will last all weekend, to be left out for family and guests to help themselves. In France, a "cake" usually means a loaf cake, like this one. Dorie advises that this cake is best eaten a day after baking so that the flavours have time to develop. This cake came together quite easily and smelled marvellous while baking, primarily courtesy of the browned butter in it, which has a nutty aroma. It also looked rather handsome once unmoulded from the tin. The cake itself is very flavoursome, with both the vanilla and rum flavours being prevalent in the finished product (note that I used vanilla extract rather than vanilla bean). It is sweet without being overly so; for children, you could easily add a glaze to the top of the cake so that they have their ultra-sweet hit. To see what the other Doristas thought of this cake, visit the LYL section of the TWD website. Today is Australia Day, and to mark the occasion, I made Donna Hay's Lamington Slice. Lamingtons are an Aussie classic, but I was attracted by Donna's slice version, which is a twist on the original. This slice was super easy and quick to make, although I found that I needed more icing than was stated in the recipe. The resulting slice is true to the essence of a lamington, with a light sponge cake base, topped with moist chocolate icing and coconut. Happy Australia Day to all of my Australian readers. 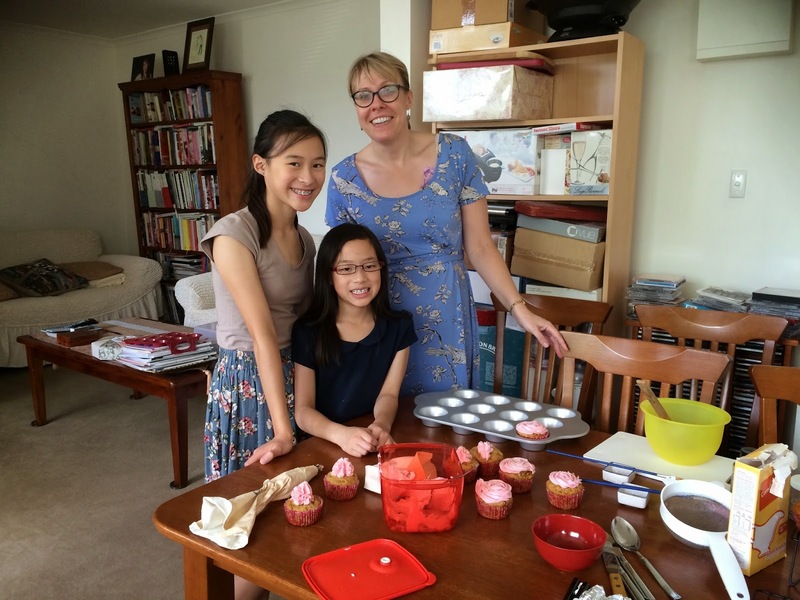 Recently, I hosted a cupcake decorating workshop one Sunday afternoon for a friend and her daughters during the school holidays. We made chocolate cupcakes together, and I had made carrot cupcakes in advance using the Crabapple Bakery cookbook recipe. A sample of the end results is pictured at the top of this post. It was glittery, sparkly and fun - I couldn't help but come out with a big smile on my face. If you liked the movie, or if you like good old fashioned fun, I recommend seeing this musical. Recently on Facebook, I spied a recipe for Magic Custard Cake, posted by a friend of a friend. The recipe was uncredited, but it intrigued me - after all, I love custard, and if this was a cake involving magic custard, well I am in! Preheat oven to 325 F degrees. Grease and Line 8 inch x 8 inch baking dish with parchment. Separate eggs and add the egg whites to a mixer and beat egg whites stiff. Place egg whites in a bowl and set aside. Beat the egg yolks & sugar until light. Add butter and vanilla. Beat for two mins. Add the flour and mix it in until fully incorporated. Slowly start adding the milk and beat until everything is well mixed together. Add the egg whites, a third at a time and gently fold them in using a spatula, repeat until all egg whites are folded in. Pour batter into baking dish and bake for approximately 60 minutes or until the top is lightly golden. Cool and dust heavily with powdered sugar. I clearly have been missing trending recipes, because when I Googled it, the recipe for magic custard cake was all over the Internet in one form or another. What all of the recipes have in common is that from a one pot, single batter, you end up with a cake with three separate layers - a base, an egg custard filling, and a soft, light, cakey top. I quite liked this cake, and it was low effort for high reward - a winner in my books. For French Fridays with Dorie this week, we are cooking - fish! What a surprise, eh. You'd never have guessed. My doctor told me to get more fish into my diet; well, FFWD is making that easy at the moment. Our recipe this week is spice crusted tuna. To give you an idea of the spices in the recipe, you can see the ingredients list here. So, you may ask - why have you made spice-crusted ocean trout when the recipe is for spice-crusted tuna? Well, apparently in my suburb, tuna is either not available or all sold out at present. I tried at the supermarket and at the specialty fish shop - no dice. What was priceless was asking the assistant at the specialty fish shop what she thought would be a good substitute for the tuna, only to have her stare at me blankly with an open mouth. I spared her the pain of thinking and chose my own fish. I really quite liked this fish dish - it was easy, quick and tasty. I also made the mango chatini that Dorie suggests as an accompaniment to this dish because I adore mangoes, and it is mango season here. It was seriously good. I served the lot with a microwaved sweet potato and some boiled veges (not pictured). I would definitely make this again - it is simple, fresh and healthy. To see what the other Doristas though of this dish, visit the LYL section of the FFWD website. Welcome to week one of our new group, Eating with Ellie. Each Thursday, we will be cooking out of Ellie Krieger's book, Weeknight Wonders. I am not familiar with Ellie or her cooking, but I am up for an adventure, so I am joining in. I am especially keen on the fact that Ellie states that the recipes in Weeknight Wonders can be made in 30 minutes or less - perfect. I am usually time poor, so the quicker that a recipe can yield tasty results, the better. For our first week, Kayte chose Shrimp with Spinach, Garlic and Smoked Paprika. This recipe can be found online here. I really enjoyed this dish. It is deceptively simple - some prawns mixed with a few spices and served on a bed of wilted spinach. However, it tastes marvellous - no other sauces or condiments are required, which surprised me, as the juices from the spinach and the prawns meld with the spices to provide their own sauce. To see what the other EwE cooks thought of this dish, visit the LYL section of the EwE website. For Wednesdays with Donna Hay this week, Margaret chose eggplant with tomato, basil and parmesan risotto from New Food Fast. This dish involves making a tomato risotto which is served atop pan fried slices of eggplant. I served mine with some cottage cheese on the side. I quite liked this dish - it was tasty, and it was very soothing stirring the risotto. To see what Margaret, Chaya, Sarah and Kayte thought of this dish, visit their websites. When Tim and I were in Hobart recently, we stayed at The Henry Jones Art Hotel, which is built within the old administration building of the former IXL jam factory. The hotel preserves many of the structural features of the original building, and if you do one of the free art tours in the hotel, they will point out various features, including the incomplete ornate carving on a staircase where Henry Jones demanded that staff stop wasting time on such trifles, and an area where squatters had burnt a hole in the floor of the building with candles. The art tour also takes in some of the many art works hung on the walls of the hotel, many of which are for sale. I was captivated by some of the art works, which are unique, beautiful and largely by local Tasmanian artists. Jam Packed Café is within the confines of The Henry Jones Art Hotel, so it made sense for us to go to breakfast there at least once. The logo and menus of the café feature prints of old IXL jam labels, which I found intriguing. I am not sure what beans they used, but the coffee was good. The marmalade was very good indeed. This looks and tastes good. Unfortunately for me, I confirmed my sensitivity to quinoa that morning, so quinoa is permanently off the menu for me, but if you don't suffer this affliction, it is a lovely dish. The staff at Jam Packed were friendly and efficient. Overall, we had a great experience there. What do you do when you have an about to expire pot of cream in the fridge and are going away for the weekend so have no chance to use it? Why, make this Orange Sour Cream Cake recipe on Taste.com, of course! For a cake that was made for a very pragmatic reason, it tasted really good. As I always do, I took it to work, and several people told me how much they liked it. When I get positive feedback, I know I'm on a winner. The recipe calls for sour cream, but I used plain old whipping cream - it worked just fine. I made a simple water icing instead of the icing called for in the recipe, and that also worked fine - a hint of sweetness without being over the top. For good measure, I used dessicated coconut to decorate the cake. Mussels always remind me of the hammam. When we'd go there I'd hear the elders open their souls as mussels do when steamed. This is my favourite mussel recipe out of Around My French Table so far, and I delightedly soaked up the sauce with bread. At least after all this practice with mussels, I am now an old hand at de-bearding them (which I hate doing). Sometimes, I just can't yank the whole beard out, so I have learned how to get rid of it after cooking. I tell you, after biting into a gobful of beards the first time I cooked mussels, I learned fast. To see what the other Doristas thought of yet another fishy week, visit the LYL section of the FFWD website. For Wednesday with Donna Hay this week, I chose Chinese barbecue pork from Modern Classics I. It was a rather disappointing dish for me in a number of ways. First, I ran out of time and the supermarket where I went to buy the pork only had pork stir fry strips. Being out of time, I decided to make do, but I am sure that this dish would have been better with the thicker pork strips (2" wide) called for in the recipe. In the end, I was also not a fan of the strong aniseed flavour from the Chinese five spice powder. This dish is probably not going to be repeated in my house. It looks pretty good, but I wasn't a fan. To see what Kayte, Margaret, Chaya and Sarah thought of this dish, visit their websites. For Tuesdays with Dorie this week, we combined some healthy but delicious ingredients to make Granola Energy Bars from Baking Chez Moi. Dorie required that one cup of fruit be used, so I used sultanas and dried apricots. Other ingredients include the (new to me) rice syrup, butter, pepitas, sunflower seeds, shredded coconut, oats, almonds and vanilla. These bars were quite easy to make - the hardest part was cutting them up in a manner that they did not break off. They were also very tasty. Although the ingredients are healthy, as the name of these bars implies, they are fairly energy-dense. For this reason, these bars will be a "sometimes only" food in my house. To see what the other TWD bakers thought of these bars, visit the LYL section of the TWD website. As a home baker, there's nothing I like better than a bakery. Accordingly, when I spied Daci & Daci Bakers in Hobart, I was like a moth to the flame. Daci & Daci is housed in lovely old fashioned premises, replete with dark woodwork and a lovely winged chair in the window seat. Its counters are packed to the rafters with all kinds of attractive-looking baked goods, sweet and savoury. They are not cheap, but I am happy to pay for quality. It was rather sweet, but that was expected. This sausage roll tasted as good as it looks, with beautiful crisp flaky pastry and a filling with just the right amount of spice. How gorgeous is that? It tasted lovely too - being a meringue, it was mostly crisp and crunchy, and on taking a bite, shattered before melting in the mouth. We loved Daci & Daci with its beautiful baked goods arranged beautifully and housed in old fashioned surrounds. We'd definitely go back. It is my brother's 40th birthday today. In honour of the occasion, my mother made him a fruit cake, which she asked me to ice. As not everyone has iced a fruit cake using fondant, I thought that I would show some step by step pictures which, although they may sometimes lead to a scary looking cake at times, contribute to the final smooth result. There are numerous Youtube videos that demonstrate how to roll out and cover your cake with fondant icing. The key trick is not to roll the icing too thin or it will tear and crack when you put it on the cake - about 3-4mm thick is a good thickness to work with. Also, make sure you have rolled out the fondant so that there is around 2 inches extra around the diameter of the cake - this will help you to smooth it down without pleating or cracking. 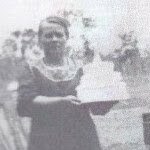 Unfortunately, try as I might, I could not get the edible image off its backing paper without damaging it, so I simply cut around it and placed it on the cake on its backing paper as a permanent, removable memento for my brother. On this day in history, Coco Chanel died in 1971 at the age of 87 - here's to the memory of Mademoiselle. We did try to eat [the Poulet en Gelee a l'Estragon]. It wasn't that bad, though when Eric saw it, his face went a shade or two grayer. It just tasted like cold chicken with jelly on top of it. We all chewed glumly for a bit, but it was no use. Ahem. Well, this is one French Fridays with Dorie recipe that I can put down to experience. As Mardi said, this one was all about the technique. That's just as well, because it certainly wasn't about the taste. All started well on the road to making Arman’s Caviar in Aspic. I had caviar. I even found fish stock (in lieu of the fish bullion cube). I made my jelly. The jelly set. Tick, tick, tick. Then the fun began. My jelly partly iced over in the fridge, destroying part of it. Then I found when I cut it into cubes that it was quite delicate - not the kind of thing I could hand around at a party. I think it needed more gelatine. 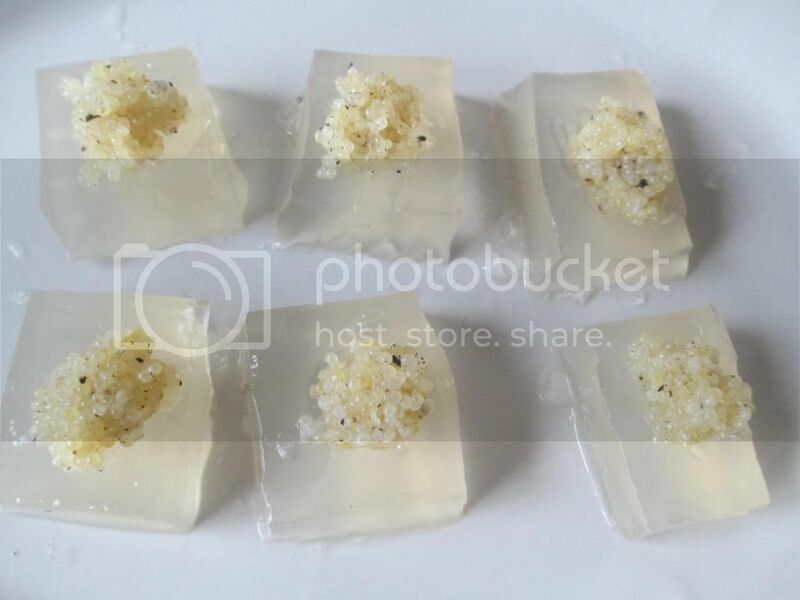 And then, after carefully spooning some caviar into my fishy jelly squares, I tasted one. I nearly gagged. Yuk! It tasted what I imagine an old smelly shoe innersole with caviar on top might taste like. Thank goodness for the garbage bin. This is one French dish that I will not be embracing. On the plus side, salmon in a jar now sounds positively appetising. To see what the other Doristas thought of this recipe, visit the LYL section of the FFWD website. 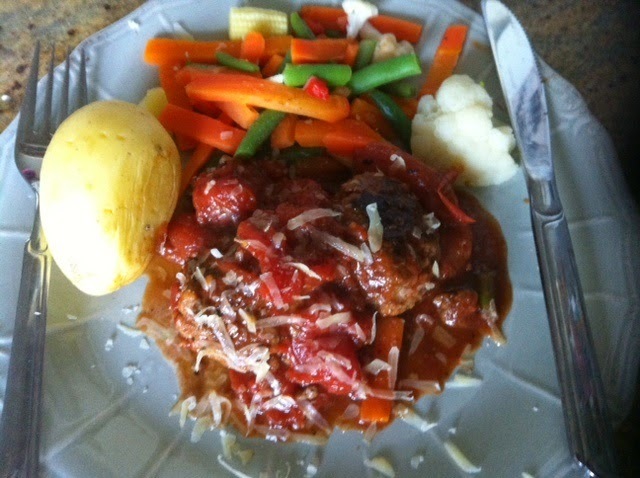 For Wednesday with Donna Hay this week, Sarah chose bocconcini stuffed meatballs with tomato sauce. Being meatballs, they really don't photograph well. However, they tasted pretty good. The bocconcini in the middle melts during cooking, so it would be a nice surprise if you had no idea it was there. I served my meatballs with potato and veges, with the tomato sauce enlivening everything. Overall, this was a pretty good dish. 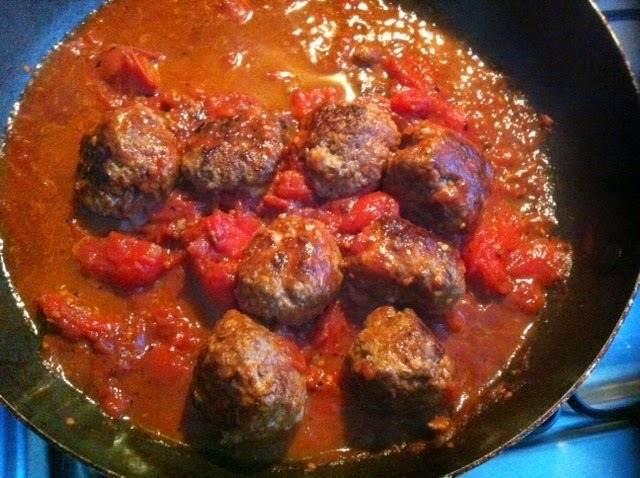 To see what Sarah, Margaret and Chaya thought of these meatballs, visit their websites.